Everyone from children and conservationists to the governor of Michigan gathered under a tent on Detroit’s waterfront Wednesday to hear details of a $100 million plan to redevelop much of the downtown waterfront into a public oasis that will connect to hiking trails across the state. The Ralph C. Wilson Jr. Foundation today celebrated what would have been the 100th birthday of its founder by donating $100 million to redevelop Detroit’s West Riverfront Park, a 22-acre site located west of Joe Louis arena at the intersection of Mexicantown, Corktown and Southwest Detroit. Wilson, a businessman and venture capitalist who grew up in the Grosse Pointe area, grew to prominence in Buffalo, NY where he was the founding owner of the Buffalo Bills pro football team. The foundation also is donating $100 million to develop LaSalle Park in Buffalo. Both parks will be called the Ralph C. Wilson Centennial Park. The tiny model on display Wednesday along with renderings showed a riverfront with a network of walkways, benches and a small peninsula that juts out into the Detroit River. 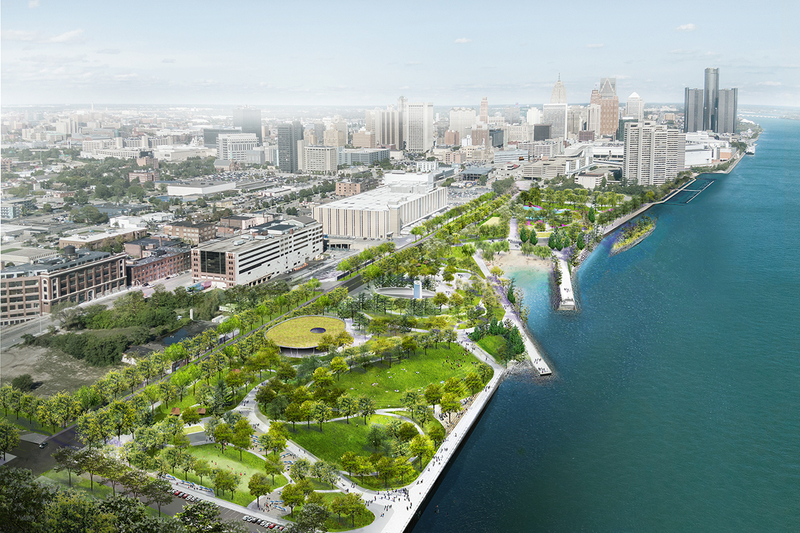 Detroit Mayor Mike Duggan said the new park will breathe life into the riverfront, allowing neighborhoods such as those in southwest Detroit that “think they’ve been forgotten” in the city’s revitalization to connect by walking trails to the city’s riverfront. Gov. Rick Snyder lauded the donation as boon for quality of life and another opportunity to expand the state’s 2,000-mile Iron Belle Trail that spans from the western end of the Upper Peninsula to Belle Isle in Detroit, he said. The grant funds to connect trails to the riverfront will be evaluated and funded on a project-by-project basis. The excitement was not lost on a group of students from University Preparatory Academy that came to hear the announcement and see a small model of the park. Kendall Crutchfield, 12, a seventh grader, said she hopes it will be as beautiful and fun as the Detroit International River Walk, the popular walkway that opened in 2007 and has a splash pad and carousel just east of the GM headquarters, commonly known as the Renaissance Center. She said she wants to see the empty grassy area turned into “good scenery” with a playground with tables and seating. Someone needs to check a map. I’d this park East or West of The Joe? I think the photo note is correct stating EAST. Remember, Windsor is NORTH of DETROIT. Is the park East of The Joe?